Drag-and-drop a file having a .csv extension into the main window. VueMinder can import events from CSV files, which are text files with values separated by commas. The first line needs to be a header, defining the field names of the data in the following lines. See below for a list of valid field names. 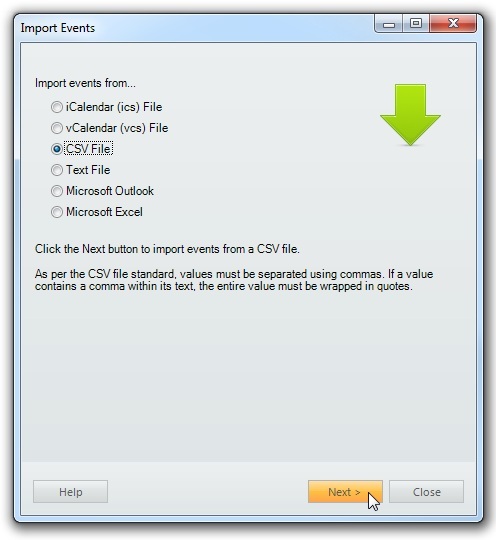 To import from a CSV file, click the "Import Events" command on the File menu. CSV files can also be dragged-and-dropped into the main window to initiate importing. To pick a CSV file to import, select "CSV File" as the import source and then click the Next button. A window will appear where the CSV file can be selected. After selecting the file, click the Open button to continue importing. After selecting the CSV file to import, the window will update to enable specification of the desired destination calendar and settings. Events will be imported into the specified destination calendar. You can select an existing calendar from the drop-down list or type in the name of a new calendar. 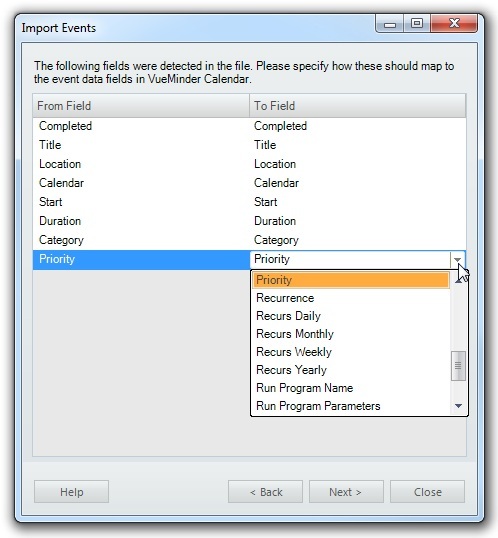 Note, if the "Calendar" field is present in the CSV file, events will be imported into the calendar names specified by the CSV file, not the calendar specified in the Import window. 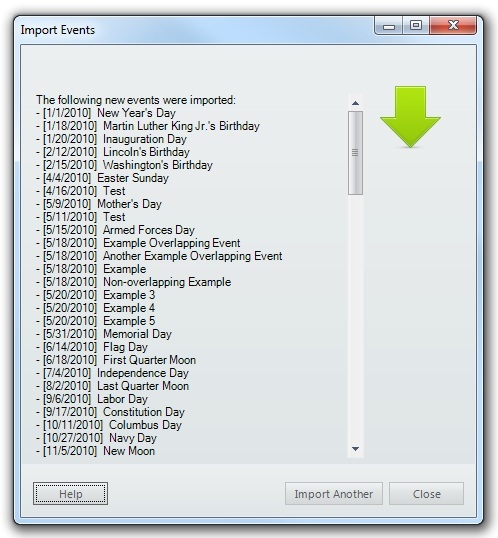 When importing into an existing calendar, any existing events will be updated instead of duplicated. The CSV file may include fields to specify event reminders. If you want to import reminder settings, check the box labeled "Import reminders, if present". This will have no effect if reminder fields don't exist in the CSV file. The following "To Fields" are supported. Most of these are optional. The only fields that must be present are "Title" and "Start". Also, since these fields might not be applicable to every event, you can leave the value blank to have the field ignored for a particular event. Category – The event category. If there are multiple categories, separate them with semicolons. Example: "Work; Important; Follow-up"
Calendar – The event calendar. 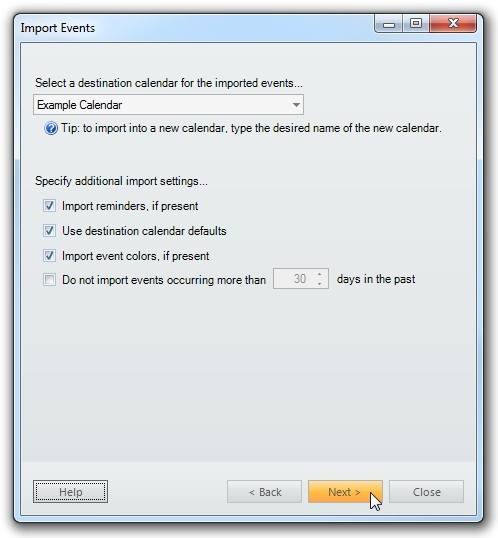 If not specified, the imported event will be assigned to the "Destination calendar" selected in the Import window. Otherwise, this will override the selected destination calendar. Description – The event description text. This is plain text, but can include HTML tags. Priority – The event priority. Example: "High". Duration – The duration of the event. It should be formatted as "N span", where N is a number and span is "minutes", "hours", "days", "weeks", or "months". Example: "30 minutes". All Day – An all-day flag. Values that are blank, "No", or "False" will be treated as non all-day events, while values of "X", "Yes", or "True" will be treated as all-day. The same yes/no value parsing is used for other flag input fields, such as the "Completed" field. Popup Reminder Time – The time before the event start that a popup reminder should appear. If blank, there will be no popup reminder. Otherwise, specify the length of time as "N span", similar to the Duration field format. Other time-span fields, such as "Desktop Alert Time" also use this format. Email Reminder Time – The time(s) before the event start that an email reminder should be sent. If multiple times are desired, separate them with semicolons. The reminder will only be sent to the email address specified in the Email Settings. Additional recipients cannot be specified by the import. This could be improved after I improve the reminder settings to enable direct email addresses instead of needing to be associated with pre-defined contacts. SMS Reminder Time – The time(s) before the event start that an SMS reminder should be sent, similar to the "Email Reminder Time" field. Run Program Name – The executable to run, including the full path (if not in the Windows path variable) and filename, when the event starts. This could be used to initiate a backup process, launch a web browser, or whatever else you want to start automatically. Example: "iexplore.exe"
Run Program Parameters – Parameters to pass to the executable specified in the "Run Program Name" field. Example: "https://www.vueminder.com"
Recurs Daily – When this flag is set, the event will be imported as a daily recurring event. The first occurrence is specified by the "Start" field. Recurs Weekly – When this flag is set, the event will be imported as a weekly recurring event. The first occurrence and day-of-week is determined by the "Start" field. Recurs Monthly – When this flag is set, the event will be imported as a monthly recurring event. The first occurrence and day of month is determined by the "Start" field. Recurs Yearly – When this flag is set, the event will be imported as a yearly recurring event. The first occurrence and day of year is determined by the "Start" field. Recurrence – This field can be used as an alternative to the recurrence flag fields like "Recurs Daily". Supported text values are blank, "Daily", "Weekly", "Monthly", or "Yearly". Font Name – The name of the font, to override the default calendar appearance. Example: "Times New Roman"
Font Size – The size of the font. Example: "12"
Font Color – The color of the event text. All color fields support several formats. These can be "R, G, B", where R, G, and B are each numbers 0 through 255 representing the red, green, and blue components of the color. Example: "128, 200, 30". The format can also be a hex number starting with either "0x" or "#". The bytes are ordered RRGGBB. For example, yellow would be "0xFFFF00". A pre-defined color name can also be specified as text, instead of numerically. Example: "Yellow". To see a list of pre-defined color names, click the drop-down button on any of the color inputs and select the "Web" tab. All the color names specified on that tab can be specified as text when importing. After specifying the field mappings, click the Next button. The CSV file will be imported and a summary of the imported events will be shown. To import another file, click the "Import Another" button. Otherwise, click the Close button to close the Import Events window.